The Coastline of Galicia region in the north west tip of Spain is known as the Costa de Marisco (transltating to The Shellfish Coast) for the obvious reason that the area is famous for the wide range of shellfish which are caught along the more than 1000km of coastline. This is of course also reflected in the cuisine of the area, as are the agricultural crops of the area and dairy animals that graze in this green part of Spain. 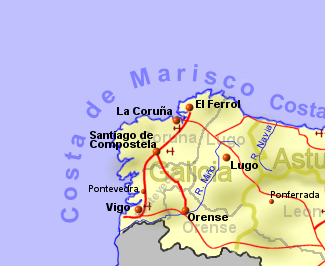 The Costa de Marisco can be divided into three areas with the central area known as the Costa de la Muerte (Death Coast) due to the dangers to ships along this area exposed to the Atlantic, including the Cape Finisterre. The north east part of the Costa de Marisco, known as the Rias Altas while the south west coast is known as the Rias Bajas. The rias were formed as the result of valleys being flooded by rising sea levels, creating sheltered inlets. The Galicia coastline also boasts some spectacular beaches with golden to white sand and backdrops that could be rocky, pine forest, or a green field. The Costa de Marisco is serviced by Santiago de Compostella airport, while La Coruna airport and Vigo airport have a smaller number of flights.